If West African nations do not move decisively towards regional integration, no amount of money, development, or agricultural technology, will be sufficient or effective at ending hunger. Oakland, CA--This new report assesses the relevance and potential of regional institutions and mechanisms in reducing hunger and undernutrition in West Africa - where chronic hunger remains pervasive - decades after the devastating droughts of the 1970s. The report analyzes the role regional institutions have in the fight against hunger and argues that, despite weaknesses, the existence and commitment of regional institutions is key. "Many issues, such as price volatility, are regional by essence and cannot be tackled effectively by individual countries. Without integration, most West African states will remain subject to the agenda and goodwill of international donors, institutions, and richer countries. Resource-poor African governments need to implement regional policies for sustainable food production, smoother regional trade, and regulated agricultural markets." Find out about ECOWAP, the comprehensive, ground-breaking food and agriculture common policy in West Africa and how it has the potential to bring durable solutions to poverty and hunger. Read more about what it will take to end hunger in Africa. 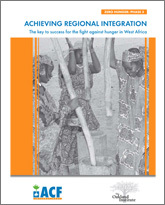 Achieving Regional Integration: The Key to Success for the Fight Against Hunger in West Africa was published as part of ACF's Zero Hunger project.